In order to determine whether Mary Jo has enough money to go camping, students create a budget spreadsheet that tracks her monthly income and expenses. This computer lesson utilizes the Fill Right, Fill Down, and SUM function in Microsoft Excel®. 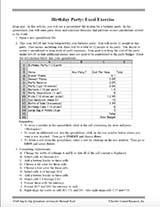 The Excel software application is required for this spreadsheet activity.